How Do You Motivate Kids To Stop Skipping School? : Goats and Soda A study in an Indian slum tried promising a reward: Improve your attendance, and you'll get a small treat. 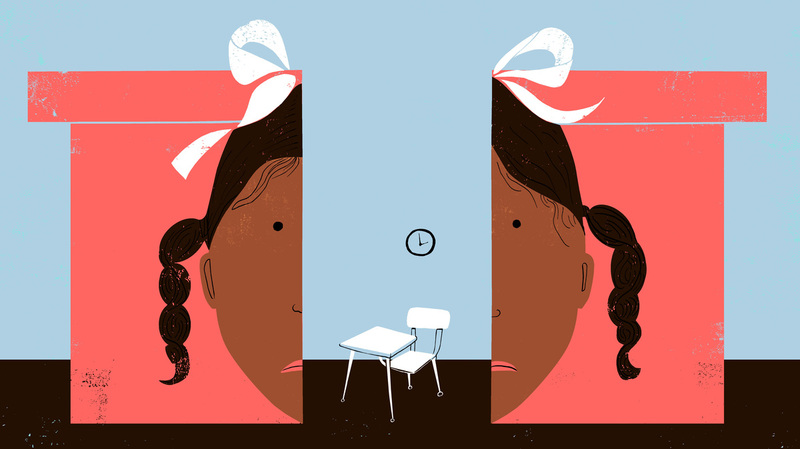 But for third-graders, sometimes these incentive schemes can do more harm than good. It seems like a no-brainer: Offer kids a reward for showing up at school, and their attendance will shoot up. But a recent study of third-graders in a slum in India suggests that incentive schemes can do more harm than good. The study, a working paper released by the Hong Kong University of Science and Technology, looked at 799 boys and girls. The kids, mostly age 9, were students in several dozen single-classroom schools run by the nonprofit Gyan Shala in some of the poorest neighborhoods in the city of Ahmedabad. I almost felt badly about what we had done. That in the end, we should not have done this reward program at all. Gyan Shala's program is free and has a reputation for offering decent quality instruction in language, math and science. Still, attendance rates are no better than the average for the region. On any given day, about a quarter of students are absent. Gyan Shala's administrators believe many opt to stay home and play if, say, it's a festival day or a sibling who attends a different school is off or simply because they're not in the mood for class. So the researchers challenged kids in about half of the classes: Over a designated 38-day period, show up for at least 32 days — that's 85 percent of the time — and get a special gift: two pencils and an eraser. That might not sound like much. And it's not as if these kids couldn't get a pencil or eraser some other way, notes Sujata Visaria, an economist at the Hong Kong University of Science and Technology and a co-author of the study. Still, such items are a treat in the slums where these kids live, Visaria says. And the erasers weren't run-of-the-mill. "We spent a lot of time trying to make sure what they got would be a little unusual," she says. "Not a plain, drab eraser but something colorful and shaped like an animal." The kids could inspect sample erasers before the 38 days kicked off. The prospect of winning the prize certainly provoked interest. The students were nearly twice as likely to attend class during the 38 days. The effect was particularly pronounced among kids whose attendance level had been the lowest before the reward program began. They were now 2.3 times as likely to come to class. By comparison, kids whose attendance level had been the highest before the reward program also improved their attendance, but by somewhat less: They were 1.8 times as likely to come to class. So far it all seemed logical, says Visaria. As an economist, she would expect a reward program to be most effective with students who don't already have some existing, intrinsic motivation for going to school — like finding class fun. After the 38 days, rewards were handed out to those who qualified in a special ceremony in front of the rest of the class. The researchers checked back on the kids two more times. And that's when things got surprising. • Kids whose attendance rate was highest in the class before the reward program. They reverted to their baseline level. • Kids whose attendance rate was lowest but managed to up their attendance enough to win the prize. After the program was over, these kids also reverted to their lower baseline level. • Kids whose attendance rate was lowest to start off with and who did not improve enough to qualify for the reward. In other words, they failed the challenge. More than 60 percent of the lowest attenders fell into this category. For them, the aftermath was grim. They were now only about one-fourth as likely to show up for class as they had been before the reward scheme was introduced. What happened? Visaria speculates that for these low-attending students, the incentive program underscored how poor their attendance was. So they may have lost what little motivation they had to begin with. Other findings in the study bolstered that theory. After the reward program concluded, the kids with lower original attendance rates were less likely to feel confident about their scholastic abilities than before. Visaria says this result was not just unexpected and cautionary but disheartening. She and her fellow researchers had been prepared for the possibility that the reward program would not prove particularly helpful, or that any positive effects would not last. But they never expected it to leave children worse off. "I almost felt badly about what we had done," she says. "That in the end, we should not have done this reward program at all."